Dizzy Miss Lizzie’s Roadside Revue is theatre and vaudeville. It’s rock and roll, bluegrass and Americana. It’s the spirit of Woody Guthrie and the dustbowl wrapped up in a gyspy punk. The spirit of the vagabond and the rebel. They are the voice of human kind’s savage soul. 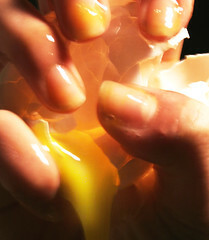 It’s pure storytelling with bare hands and authentic voices. Storytelling cranked up good and loud through a Telecaster and a Marshall amp. DMLRR was founded in Washington DC by veteran actor/musicians Debra Buonaccorsi and Steve McWilliams. Led by their common love for theatre, rock and roll, and the traditions of American music and storytelling, they sought to bridge the gap between a night at the theatre and a rock concert. 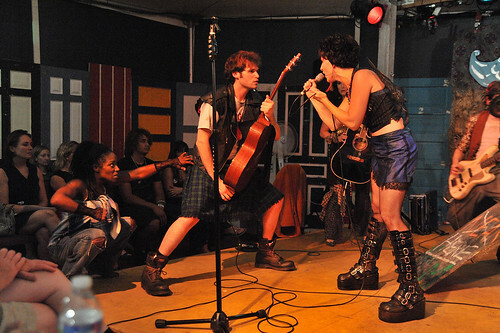 Pictured: Debra Buonaccorsi (foreground) and Steve McWilliams (R) in "Dizzy Miss Lizzy's Roadside Revue presents Finn McCool" at the Capital Fringe Festival, July 22, 2010. Photo copyright 2010 by Paul Gillis Photography; used by permission. How did you first hear about Fionn mac Cumhaill? And what was the inspiration to bring his origin story to life with a rock and roll show? It was an idea that Steve and I had been tossing around for a while- we'd never nailed it down to one particular Irish legend. I was into all things Irish in high school- literature, music, culture, Bono etc… and my sister, upon returning from a trip to Ireland, brought me a book called Gods and Fighting Men, which was a book of Irish Mythology compiled by Lady Gregory (a good friend of William Butler Yeats). The stories were odd and funny, as mythology usually is, but they stuck with me. When my good friend Laura Keena, the actress who played the Druidess Bodhmal in the show, brought Finn McCool up as a possible subject for a DMLRR show, I was instantly inspired. Laura’s parents have this amazing wood carving that they brought back from their honeymoon in Ireland, of the Finn McCool legend. It has the faces of Finn and Finneces carved out, there’s a salmon in there somewhere. So, the Laura and I set off to googling Finn McCool, and called Steve. Being of Irish descent and having spent time in Ireland, Steve was familiar with Finn and loved the idea. Rock and roll is an essential part of the DMLRR aesthetic. There is something so “everyman” about rock music. It’s unpretentious, unadorned, high energy, it’s visceral and cuts to the chase. That’s why we feel it suits us and our storytelling. The extra added bonus of Irish legend and rock music is that there was so much inspiration in Irish music and Irish rock music. The Irish have been telling great stories through music for centuries- so we thought it was a perfect marriage. Did you consciously view this show as storytelling, as opposed to a rock opera, or a musical, or a live concept album? Were you worried about the audiences knowledge of this story (or lack thereof)? Maybe we should have been more worried. There was a mention in a review about “barely decipherable Irish names.” That’s never stopped people from understanding Chekhov, and those are barely decipherable Russian names. Most of the negative comments about the show have been about the confusing story and names. I thought it was pretty simple stuff. We’re thinking in the re-write that we would add a story song to get all of the necessary exposition and background out. We’re also thinking of using multi-media “cave painting” -esque drawings to assist in that area. What does the rock and roll revue format give you artistically that traditional musical theatre doesn't? Both Steve and I have spent a lot of time in the musical theatre world and we both have grown dissatisfied with its limitations and conventions and we question the cultural relevance of musical theatre as an art form. We started out trying to tap into the traditions of vaudeville and burlesque—“low” forms of entertainment and we’re both rock and rollers—also considered a “low” form—in fact, I recently heard rock and rock described as a “derivative” form of music. Which I had to laugh at: what isn’t derivative? We’re all walking derivatives. Anyway, as I said earlier, the rock and roll revue format gives us freedom to have fun and be loose. There’s so much energy and immediacy in a rock show. Someone once said after seeing one of our shows, that we weren’t acting like we were having fun: we WERE having fun. Steve and I call Dizzy Miss Lizzie’s Roadside Revue our playground. We simply invite others to come and play with us on our playground. You can play with us, or if you don’t like our games, you can take your ball and go home. 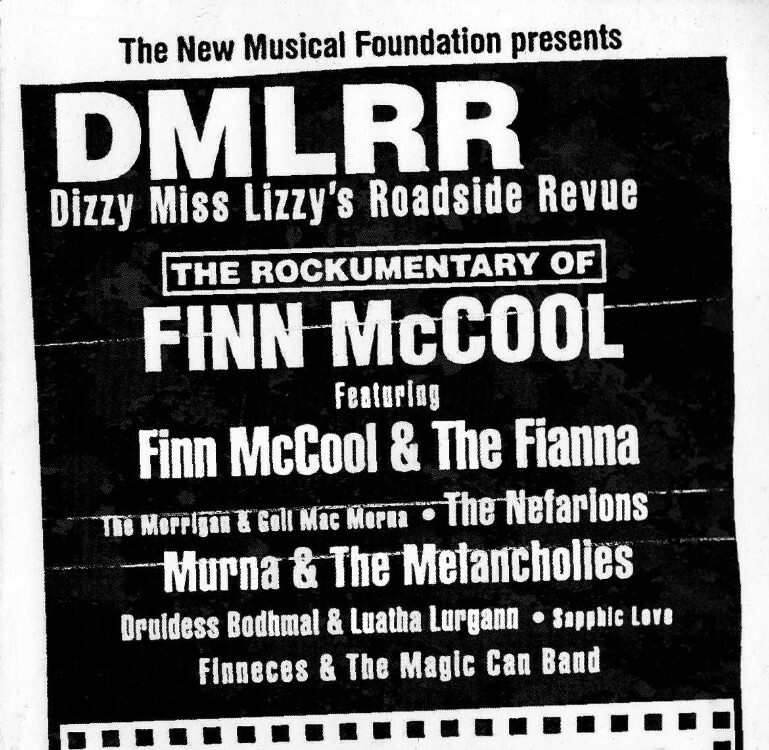 If you live in or near the Washington DC area, you can see the show again in 2011: DMLRR has recently completed a Kickstarter fundraising campaign to self-produce "Finn McCool" in March at the Woolly Mammoth. As an out-of-towner at the Capital Fringe Festival in Washington DC this past July, I had minimal information to go on in selecting which of the 137 productions to see. I did what research I could, visiting performer's websites, paying attention to local reviews... but with limited time and money, I mainly chose based on content: what was the show about? 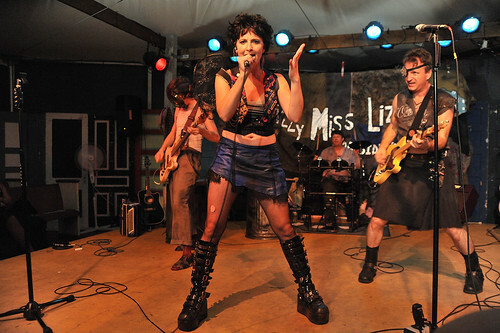 When I discovered, on the Fringe web site, that there would be a "post-apocalyptic, raucous, rock and roll, retelling of the Irish legend: Finn Mc Cool" by a group called Dizzy Miss Lizzy's Roadside Revue, I made time in my schedule. Now, as a storyteller, I'd certainly heard of Fionn mac Cumhaill (my Celtic storytelling colleagues would never forgive me if I didn't use the Gaelic spelling). Over the years, I had heard a tale here or there of this Irish warrior-king of the Fianna, but I'd never read or heard Finn's origin story (And, truth be told, hearing one too many versions of the tall tale where Finn meets Cuchulainn did not inspire me to seek it out). So now here, I hoped, in DC, I'd get to hear it... gathered in the darkness with strangers to hear a story. Only we weren't gathered in the dark. We were in a portable tent (a good omen for storytelling) set up as a temporary venue constructed for the duration of the Fringe, with a massive soundsystem (so it could double as the party spot) and a roof to keep the summer thundershowers off the outdoor thrust stage (seating on three sides). Though not air-conditioned (and in DC in July, that fact made it into every review of each show that played there), the venue was conveniently located next to the Fringe bar. The stacks of amps, full drum kit, microphones, and numerous electric guitars on the stage made me realize this was not going to be your average storytelling set. 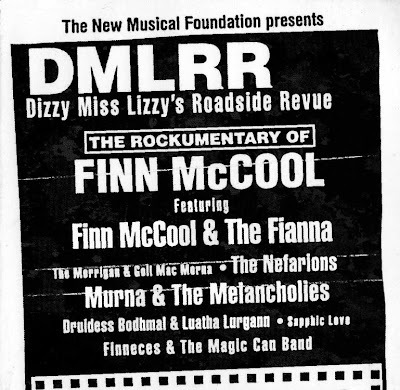 The programs and postcards for the show set up the frame that the legend of Finn McCool would be presented as a rock and roll revue with six bands on the bill (With just 8 performers in the show, the "bands" were created with costume changes and sometimes switching up instruments). And so, in music and song, we were treated to Finn's origin story: how his father, leader of the Fianna warriors, was killed by Goll Mac Morna; how his mother gave him up to be raised in secret by the druidess Bodhmall and the warrior woman Liath Luachra; and how Finn obtains the Salmon of Wisdom during his service to the poet and teacher Finneces, which enables him to claim his place as leader of the Fianna and defeat Goll. Plot points were kept to a minimum to let the music do the heavy lifting of the show: and it worked. The music ranged from ballads (both acoustic and power) to art rock to stadium rock to blues... the troupe used a wide musical palette to vary the emotions through the arc of the story, and the audience cheered every time they recognized a trope (e.g. guitar solos, power duets, drinking song choruses). 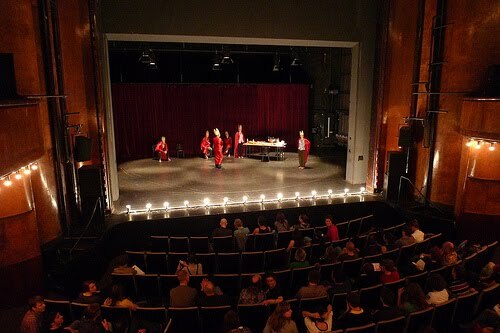 I was also impressed by the quality of the performers (though the show had a thrown-together, held-together-with-duct-tape thrift-store aesthetic, everyone in it, from the costumer to the composer to the performers had bona fide professional theatre chops). The singers--most with musical theatre backgrounds and many recognized by local critics and peers with theater awards--really delivered, as the variety of songs explored a vast emotional range. This show called to mind ancient traditions of epic storytelling, where the community gathered to listen to stories of heroes, and achieve an altered state of consciousness. At the Fringe, our consciousness was being altered not only by our willingngess to engage with the drama, but the soaring melodies and the volume of the music, but by the venue's heat, humidity, and proximity to the performers (no one was farther than 15 feet from the stage). The availability of alcohol helped, too. Furthermore, the posturing and tropes of rock and roll passed for modern day versions of the ritual required for the sharing of such epics. So, while in an oral culture, everyone in the audience would know the story (e.g. the Ramayana) , this performance gave the audience a story in a style everyone knew, though many weren't familiar with the characters or plot. The creators of the show made sure that before and after each song, characters explained who they were, what they wanted, and where they were going. The extra exposition here was necessary for an audience unfamiliar with this epic. Some reviewers complained that the exposition muddied the dramatic arc, but I found it was not only necessary to get the story out, but actually a clever way to continue to build the trance state you want in an epic storytelling session (My own theory: by giving the logical brain narrative, we're compelled to engage more--to find out what happens next-- which allows us to continue in the performance environment towards a trance state). Me? I’m predisposed to enjoying epic narration (my list of most enjoyable theatrical experiences include narration heavy shows like lookingglass theatre’s Argonautika and Metamorphoses, and Mabou Mines’ Peter and Wendy… and to which, I’m adding this production), so my enthusiasm for this show might differ from the typical DC theatregoer, but all in all... I found it a thoroughly delightful way to engage with an ancient myth, and in terms of artistic craft, an inventive and masterfully crafted performance experience. Storyteller Gemma Hannah of London has put out a call for storytellers: storytellers who are willing to collaborate-- via video-- on a multi-teller version of Anansi and the Box of Stories. Watch her version (see below), then post a video of your telling (on Vimeo). Once she has a variety of versions, she'll produce an edited version featuring storytellers from around the world. 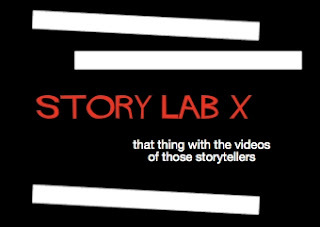 The 99% has posted a talk by storyteller Jay O'Callahan, in which he shares some of his process for developing stories. Included is an excerpt from "Forged in the Stars," a story commissioned by NASA on the occasion of its 50th anniversary. The audience for this talk aren't storytellers, so O'Callahan's simplifies his process greatly (you would too, if you only had 20 minutes to explain what you do), but notice how the story he tells to illustrate his point is a story about storytelling. In his telling, he's not telling the story of the moon landing, he's telling the story of Neil Armstrong telling the story of the moon landing. I can't quite remember the timeline of how I met Ellouise Schoettler. I'm sure it was via email first (perhaps on STORYTELL). She introduced herself in person at the Bay Area Storytelling Festival. I ran into her again in Fresno, California, at the Rogue Festival. And then I found her blog, and her online videos. I've learned a lot from Ellouise: we worked together in a MasterMind group, and this year, we each had shows at the Capital Fringe Festival in Washington DC (where I finally got to hear her tell in person... and she had one of the most focused, robust social media strategies for promoting her show of any of the 130+ artists in the Festival). While I was there, she asked me to come be interviewed on her cable television show, "Stories in Focus," and I was delighted to talk with her on camera about my work as a storyteller and storytelling blogger. Considering we didn't plan our conversation at all, I thought we managed to sound reasonably coherent. Ellouise wanted to keep the conversation lively, so all I knew going in was that I could tell a story (about 10-12 minutes long) and that I should think of a tip to share at the end of the show. Storyteller Mark Goldman may be relatively new to the storytelling community, but one thing he's been doing recently is asking professional storytellers for advice to share with everyone. Thanks to Mark's iPod (with a built-in video camera) and YouTube, you can see the results in one-minute video bites. 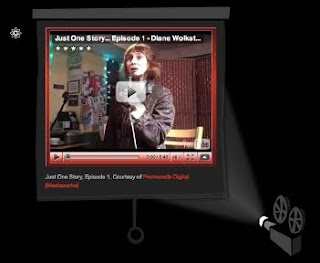 And Mark's recent trip to the National Storytelling Network's 2010 Conference means he's got a bumper crop of new videos. I'll have more to say about the four days I spent in Los Angeles at the 2010 National Storytelling Conference, but I wanted to publicly thank all the Conference organizers, from those who found the hotel venue to those who read proposals to those who auditioned performers. I especially want to thank NSN staffers Karin Hensley and Kit Rogers who do a million things behind the registration desk and behind the scenes cheerfully and efficiently, --and a special shout out for the sound crew (Steven Henegar, you're my hero). Thanks to Mike Speller, Lisa Rowland, and Nancy Donoval for being willing to jump into Ruth Halpern's and my late night fringe show and improvise without knowing what would happen. So many workshops, performances... it was impossible to fit them all in, so if we only had time for a hug, a hello, a "how's the conference going for you," a brief hallway chat: I just want to say how glad I am to have made the connection, no matter how brief, if only to prove that you're not just an imaginary "friend" I connect with via a 75 x 75 pixel photo on my computer screen. It was great fun to meet new folks, meet online friends in person, and catch up with old pals. Hey, if anything I said or did during the preconference / fringe / showcase / panel / back of the room discussion / late night at the pool bar / early mornings by Starbucks / passing in the hallway raised a question for you... let me know. Email me. I'm delighted to continue the conversation. I returned recently from ten days in Washington DC telling stories at the 5th annual Capital Fringe Festival. I'll have more to say both about my run of shows and the other performances I encountered, but here's a quick summary of some of my experiences. Solo performers support solo performers. A hundred and thirty shows to choose from? Doesn't matter how good your postcard is. You need buzz, targeted marketing, and personal connections. And, in DC in the summer, an air-conditioned venue. Be nice to the venue manager. Among other things, she's in charge of the air conditioning. Whether there are 12 people in the audience or 50 people, you still have to deliver. Media outlets don't have storytelling critics. So if they send a theatre critic to review your show, they may not understand what you're doing. Don't forget your vocal warmup. It is possible to do a show without air conditioning (in Washington DC in the summer), but it's not pleasant. It is possible to do a show without a vocal warmup, but it's not pleasant. It is possible to do a show without pants. So, when do stories transport you? Read more about the story listener's state of transportation in "The Enchanted Imagination: Storytelling's Power to Entrance Listeners," by Brian W. Sturm, American Library Association, September 27, 2006. Link. Stumbled across this audience warm-up: an old outdoor education standby for focusing the attention of a large group of campers, adapted here by storyteller David Novak for storytelling. File this in the "why didn't I think of this before?" drawer. What does storytelling look like? This question, "What does storytelling look like?" came up as I was re-designing a website for a local storytelling organization. I was having trouble porting over the organization's website header to the new template, and so I wondered if I could create a new one, using a combination of the organization's logo and an image that captured the essence of storytelling. It's hard to capture that moment in a photograph. You'll notice that a lot of professional storytellers have head shots (de rigeur for business)> Many have publicity photos of themselves in a dynamic pose. The pictures are attractive, even engaging, but they don't show the act of storytelling: they hint at it. I visited some stock photo sites, but the few images that turned up were too staged, and often featured a parent reading a book. Google images wasn't much better. I ended up abandoning my attempt to create a new logo, but the question came up again when I noticed that over at the National Storytelling Network, the front page had added a slideshow. The questions of "what does storytelling look like?" came up again. A picture of a storyteller on a stage documents a performance. It shows that storytellers so-and-so were at such-and-such a place for this-or-that event. It might even be a dynamic shot. But if I don't know who that performer is, or that it's a storytelling event, would I think "storytelling" just from the photo? Does the audience need to be in the photo? And how would you distinguish a photo of someone giving a speech from that of someone telling a story? I don't have an answer. Have you seen a picture that captures the essence of storytelling? Post in the comments. Selections from The Ray Hunold Photography Collection (19,000 photos of storytellers, housed at UC Davis) Scroll down to see some B&W photos of West Coast tellers from two decades ago.